Three years ago Branson elected a new mayor and an era of unprecedented corruption was born. As money flowed to business partners and conflicting boards of which the mayor served and currently serves on; all commerce to which Raeanne Presley wasn't personally or politically in vested in came to a screeching halt. Following a previous administrations multi-billion dollar economic engines, Presley had one project to steward. 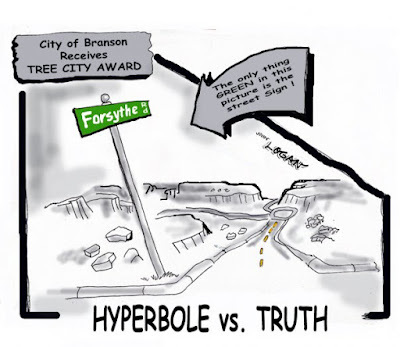 The project is an ongoing disaster and eyesore to the community which cartoonist John Logan illustrates in the cartoon above.